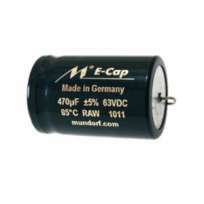 The M-CAP is an audiophile metallized polypropylene capacitor. In selection of the materials used, special attention was given to the sound properties. Great care taken during the production guarantees constant high quality and minimum electrical and mechanical tolerances. 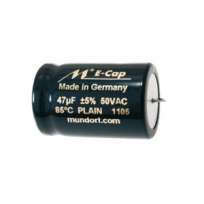 Thus, in the final inspection, maximum deviations in capacitance of 1.5 % are measured, so the guaranteed value of 3 % is far exceeded. 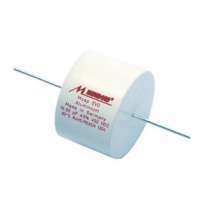 The practically induction-free type of construction and the low loss factor of the M-CAP results in a very "quick" capacitor. The M-CAP forms the basis for vivid music reproduction rich in nuance. 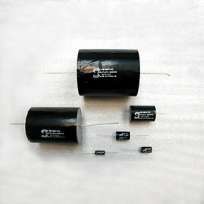 The 630 V DC version with capacitances in the range from 0.1 µF to 0.82 µF is equally suitable as a bypass capacitor in high quality frequency crossovers or as a coupling capacitance in valve and transistor amplifiers.